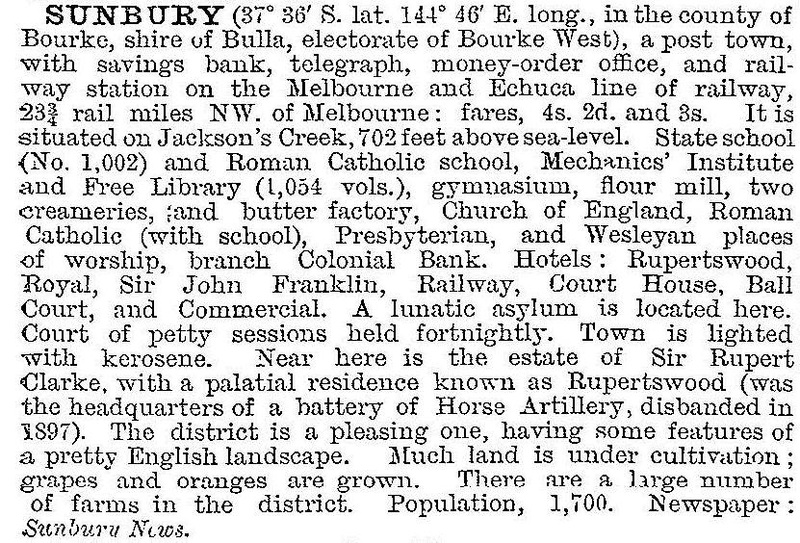 Sunbury, on the Melbourne to Bendigo railway line, became a well-established regional centre in the 1860s, and because of the ease of getting to and from Melbourne, it seemed a sensible place to establish a mental hospital in 1879. Just over one hundred years later, the hospital became part of a campus of a university. Rapid suburban growth from the 1970s, spurred by blocks of land much cheaper than anything on offer in Melbourne’s middle ring suburbs, saw its population rise dramatically. Sunbury is a residential ‘satellite’ township 35 km north-west of Melbourne, east of the Calder Highway. It is situated on Jacksons Creek, which enters the Maribyrnong River at Sydenham. Two minor creeks enter Jacksons Creek in the Sunbury township. The Sunbury area was settled within seven months of the first European settlement of Melbourne by Batman and Fawkner in September 1835. John Aitken, a Tasmanian like Batman and Fawkner, had inspected the Port Phillip district in August 1835, and in March 1836, he drove sheep from Mornington Peninsula to Mount Aitken, north-west of Sunbury. The settlement of Sunbury proper followed three months later in July 1836, when George Evans and William Jackson occupied small farm holdings. Both had travelled in Fawkner's ‘Enterprize’ which brought Melbourne's first European settlers in 1835. Jackson was joined by his brother Samuel, and they named the place Sunbury after a town on the Thames River in England. George Evans settled at a place he called Emu Bottom. The sandstone homestead he built in 1836 is incorporated in a larger building which was restored in 1970 and again after a fire in 1980. Along with farm outbuildings it is heritage listed and used as a functions venue. By far the most influential ex-Tasmanian to settle in Sunbury was W.J.T. ('Big') Clarke (1805-74). Already a pastoralist in Tasmania, Clarke shipped ewes to Port Phillip in 1837. Within a few years he acquired pastoral licenses for 12,140 hectares. In 1980 he obtained a special survey purchase of 12,700 hectares extending from the foothills of the Macedon Ranges to south of Sunbury. He later obtained a similar sized area to the east. Clarke's son, also William, built Rupertswood in 1874, a 50 room mansion at the junction of Jackson Creek and the streams that flow through the Sunbury township. Its ballroom, lookout tower and magnificent gardens made it a centre of hospitality, at least while Clarke was not residing at his equally palatial town mansion, ‘Clivedon’, in East Melbourne. Clarke was president of the Melbourne Cricket Club, 1880-86, and accompanied the English cricket team on its voyage to Australia in 1882. A month before leaving on the voyage the English team had been defeated by an Australian team, leading to an amusing public notice in the Sporting Times lamenting the loss. It was expressed in terms of cricket having ‘died at the oval’ and ‘the ashes taken to Australia’. After playing several matches the tourists stayed at Rupertswood after Christmas. They played a social match against Clarke's workers and guests on the Rupertswood cricket paddock, and tradition has it that Lady Clarke presented to England's captain the ashes of the bails or a stump, placed in a small urn, as a token of the mythical ashes. The urn is housed at the Marylebone Cricket Club. Clarke also formed a Battery of Horse Artillery in 1884. Rupertswood was acquired by H.V. McKay (Sunshine Harvester manufacturer) in 1922 and subsequently by the Salesian Catholic teaching order (1927). The Salesian Society used the property as a boarding school for boys. Two Catholic priests were later gaoled for sexually abusing children in their care at the school. Most of the large holdings were sold off by the family during 1902-10. When the railway line was constructed between Melbourne and Bendigo (1859-62) it was surmised that the route was dictated by Clarke, providing convenient stopping places on his extensive property. Equally plausible is the view that the route chosen kept down construction costs. The route through Sunbury, however, required tall arched bridges over Kismet and Jacksons Creeks. Both are heritage listed. When the railway reached Sunbury new settlers were establishing vineyards near the township. Two of them were ‘Craiglee’, south of the Melbourne road before Jacksons Creek, and ‘Goonawarra’ on the other side of the road (finally to become a housing estate of the same name in the 1980s). Several other vineyards opened south of the township. In 1860 a Catholic school and church were opened in Sunbury, along with an Anglican school. The permanent Anglican church was opened in 1867, the Presbyterian church following a year later. Sunbury's first government school opened in the Presbyterian hall in 1869. South of the township on a conspicuous hill an industrial school was established, in effect a children's reformatory. In 1879 it became a mental hospital. The mental hospital had upwards of 800 patients and was major source of local employment. After the departure of the Clarke family's social calendar from Sunbury the township settled into a village environment beyond the outskirts of metropolitan Melbourne. Until the 1950s Sunbury competed with Bulla for the site of the Bulla Shire's offices. When the offices were moved to Sunbury in 1956, the firm of Reid Murray Holdings, Melbourne, was on the verge of diversifying into a vast range of dealings. Among them was Paynes Properties (derived from Paynes Bon Marche department store) which promoted Sunbury as a satellite town, such as Dandenong (Melbourne) or Elizabeth (Adelaide). When Paynes acquired over 1000 hectares of land Sunbury's population was about 1300 residents and 1100 patients at the hospital. The scheme envisaged housing for 40,000 people. The 1961 credit squeeze and its ramifications caused the scheme's collapse, but not before Sunbury benefited from some new housing and became better known at large. Paynes estate is south-east of the intersection of Gap Road and Elizabeth Drive. Most streets are named after explorers and most houses are weatherboard and/or fibro cement. In 1962 a small high school was opened, and in 1966 the construction of the Melbourne Airport began nearby at Tullamarine. The resulting employment brought new residents to Sunbury. A second primary school, Sunbury West, was opened in 1971. Malley's Industries opened a factory in 1969, the first of several manufacturing industries. In the early 1970s the first ‘Woodstock’ type Sunbury pop festival was held on a nearby farm, signifying a further transition from rural town to engagement with the nearby metropolis. By the early 1980s two more primary schools and a Catholic school were opened, and a third school site earmarked in the Goonawarra estate. The mental hospital was renamed the Caloola Centre in 1985 and decommissioned seven years later as people with mental disabilities were de-institutionalised. Shortly afterwards it became a campus of Victorian University, Jacksons Hill. In 1989 the Sunbury Square shopping centre was opened, comprising a supermarket and 43 other shops. The traditional strip shopping centre was more than doubled in size during the 1980s-90s. The watercourses in Sunbury have ensured several parklands, including the Clarke Oval and Sunbury Recreation reserve. The Goonawarra golf course adjoins Jacksons Creek, as does the Holden Flora and Fauna reserve near the University. Craiglee and Goonawarra vineyards have been re-established. Hume City Council adopted the Sunbury Town Centre Plan in 2008. This plan identified future development opportunities to meet the needs of the Sunbury community. The Sunbury Day Hospital opened in 2011. The Sunbury Business Park was developed in 2013 as a mixed business and industry park. Located on Vineyard Road, the primary access into Sunbury from the south, the site has close proximity to the Sunbury Town Centre, the Calder Freeway and the Sunbury CBD. To its west is the proposed Rosenthal residential estate and the expanded urban growth zone to the south connected by future rail. The Caloola Centre, Emu Bottom, Craiglee, Rupertswood and two railway bridges are listed on the Victorian Heritage Register. Used as a hotel and wedding venue, the entire contents of Rupertswood were sold off by auction in 2014 and the building changed to administration offices for Salesian College.